Dragon is the perfect companion who can fly and breathe fire out of its mouth. 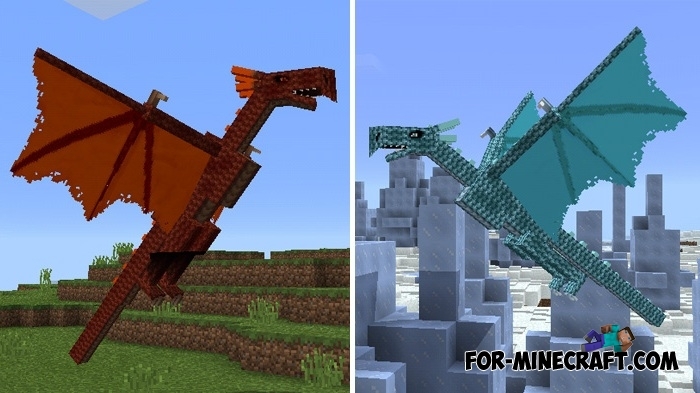 Dragons addon adds 3 different types of dragons each of which grows during a time and can be tamed in Minecraft PE. If you tame and grow the dragon, it will become your best shield, even golems will envy you. How to grow the dragon? There are six stages of growth, when the dragon increases in size and becomes more dangerous. The first stage is the baby dragon that is not a threat. 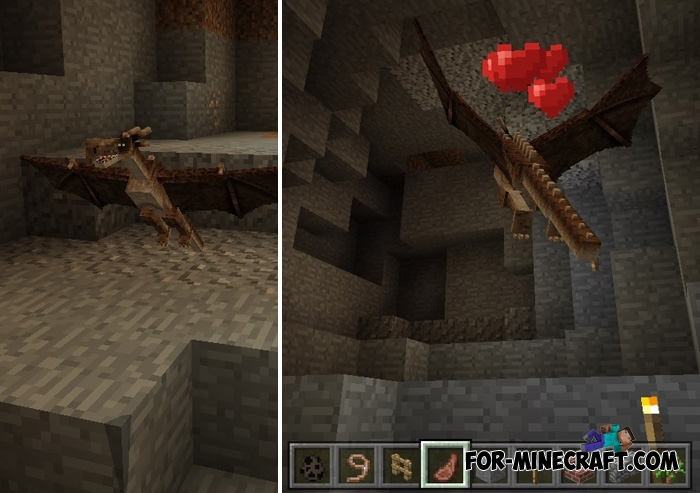 It does not attack other mobs, as well as is very weak. The last stage is a huge and dangerous dragon several times bigger than you. It uses the fireballs as a weapon and has a huge stock of health. Tame it and forget about a bow and a sword. How to find the dragon? Initially dragons live in caves and are wild. You need to tame them, only then you will be able to feed and raise them. So run to a nearby cave and feed the dragon using meat. The more you give the meat to the dragon, the more it becomes. So a simple way you can grow very impressive dragon, who will attack anyone who hits you. There are 3 types of dragons (added to the archive). They have the same characteristics and do not differ from each other. For example, all of them cause the same damage. But each type looks especially having a unique coloring. In the case where you live in a winter biome, you will definitely come in handy ice dragon. How to install the Dragons addon? Download the archive and extract the behavior file and one of the three dragons (choose at its own discretion). Open the game and go to the world settings.